Forty-one years ago this month, James Callaghan finalised the renegotiation of Britain’s EEC membership at a Dublin meeting of the European Council. At the subsequent referendum the results were emphatic. The UK voted ‘yes’ to remaining in the EEC, the forerunner of today’s EU, by a two to one margin. Now with the EU referendum date set, this article considers the key differences between the 1975 and 2016 votes and the lessons of the 1975 renegotiation for policy-makers planning for the vote and its aftermath. The first striking difference between the 1975 and 2016 referendums is the wording of the question which voters are being asked. In September David Cameron accepted a recommendation by the Electoral Commission that voters be directly asked whether they wish to stay in or leave the EU. This marks a radical departure from the precedent of the 1975 referendum. 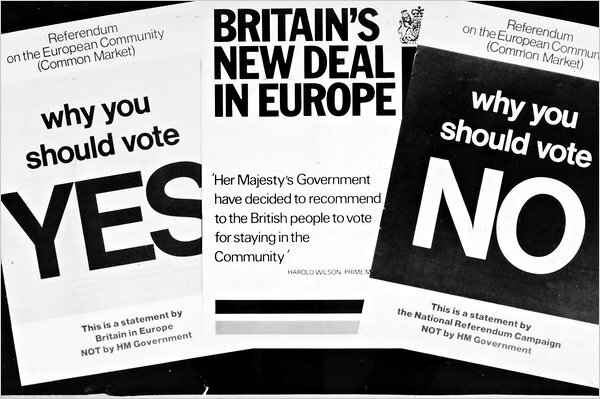 Significantly, opinion polls from the time suggested that many Britons were unhappy with various aspects of EEC membership, however they were willing to support continued membership on the terms proposed: ‘Do you think that the United Kingdom should stay in the European Community (the Common Market)’. Interestingly, the Cameron government’s original preferred wording for the upcoming referendum closely resembled that chosen by Harold Wilson in 1975. The 1975 referendum demonstrates the importance of how the European question is framed in another way. Britain’s recent renegotiation of its terms of membership was mentioned at the top of the ballot paper and appears to have been a vote-winner. Gallup polls held before the renegotiation suggested willingness to support new terms of membership. The ‘yes’ majority widened significantly after the final renegotiation talks, with the Yes camp enjoying at least a sixteen per cent majority among decided voters for the final three months of the campaign. With supporters of continued EU membership enjoying no such advantage today, the renegotiation terms are likely to be a major area of contention over coming weeks and the Yes campaign will need to make a clear case for the value of the new terms. Given the current uncertainty over the likely referendum result, contingency planning to meet the various outcomes will also be a key concern over coming months. Former cabinet secretary Gus O’ Donnell has recently commented that it is likely that civil servants are ‘mentally’ carrying out work in preparation for a potential British exit. Interestingly, the Cabinet Office, Treasury and Foreign Office were involved in substantial planning for a British exit in 1975. At the time, there was particular anxiety about how a British exit might affect the stability of the EEC. Civil servants expected that Denmark might join the UK in leaving and worried that bilateral relations with the Republic of Ireland would be complicated, potentially exacerbating problems in Northern Ireland. Much of the contingency planning in 1975 focused on the complexities of leaving the EEC, for which there was no precedent. A Treasury memo produced at the time claimed that ‘a swift withdrawal is extraordinarily difficult to reconcile with the facts of international political life’. Some ministers publicly called for a withdrawal from the Community no later than 1 January 1976. And yet, behind the scenes, civil servants raised concerns about the viability of negotiating an early exit, which largely relied on the goodwill of other EEC members. If the January deadline was not met then Britain’s budget commitments of £200 million would likely have remained in place for another year. It was hoped that a treaty of withdrawal could be kept as short as possible, with more complex aspects of Britain’s future trading arrangements to be settled afterwards. Whilst Article 50 of the Treaty of Lisbon (2007) includes a clause for Member States to voluntarily withdraw from the EU, the growth of this organisation’s functions over recent decades means that the procedure for Brexit remains highly complex. In many ways the stakes of voting on EU membership are higher now than in 1975. Indeed, the wording of the referendum ballot paper means that voters will be given a specific ‘in-out’ question on membership for the first time. Convincing voters to support the renegotiation terms may also be harder now. In 1975 Britain had only been a member of the EEC for two years and was economically ‘the sick man of Europe’, having been particularly badly hit by the oil price spike of 1973-74. Many voters were dissatisfied with aspects of Britain’s EEC membership but willing to endorse it for fear that exit would leave the UK internationally isolated. By contrast, developing links with emerging markets like China and India is today commonly seen as crucial to Britain’s future economic growth and the problems of the Eurozone have tempered the appeal of the EU as an economic unit. Regardless of the outcome of the upcoming referendum, and with the UK’s next presidency of the EU due to begin in July 2017, the nation’s shifting relationship with Europe is due to be a key matter of interest for some time to come.